Memorial Day is almost here and while I’m as guilty as anyone about looking at it as a 3-day weekend that is the official start of summer which often includes pool openings, barbecue and picnics, however, this year the real significance of the holiday is particularly poignant for me. 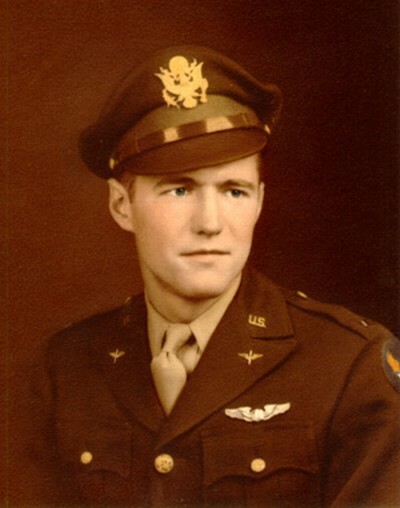 My father served in the Army Air Corps during World War II (now the Air Force) and each Memorial Day I made sure to tweet a link to his military activity as included in the WWII Memorial in Washington, DC. as a way to honor his service to our country; something he was very proud of. Although Memorial Day is more specifically to honor those who have fallen in service to their country I can’t help but think of my dad too; we’re so lucky he did not. My dad passed away a few months ago shortly before his 92nd birthday so this seems a different kind of Memorial Day. 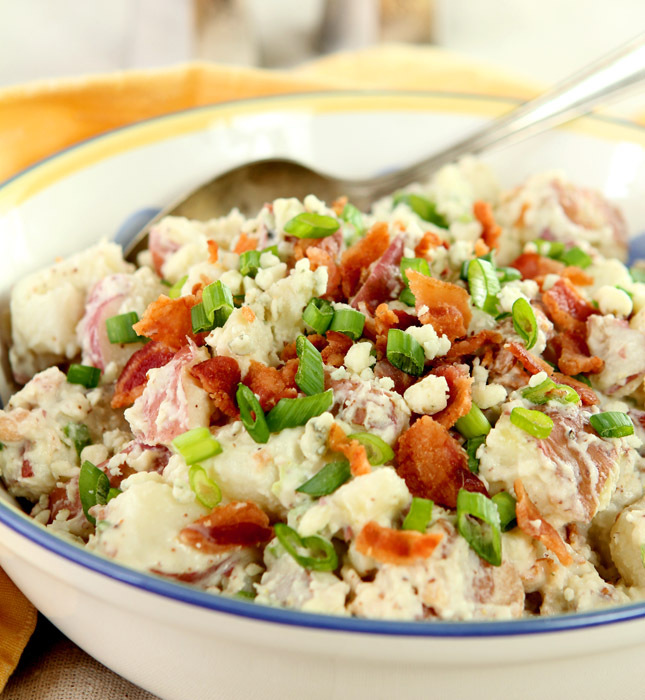 It might seem silly but when I decided to make a potato salad to share today I wanted it to be something I know he would enjoy and this bacon and blue cheese potato salad incorporates two things I know he loved. While serving up this potato salad in his honor, I am also reminded with his passing that the men and women who served our country during those dark days are fading fast and thought I would mention how you can do one thing to keep the memory of their service with us for eternity. The National WWII Memorial is operated by the National Park Service and is open to visitors 24 hours a day, seven days a week. It was opened in 2004 and is flanked by the Washington Monument to the east and the Lincoln Memorial to the west. Visitors to the Memorial can search multiple databases for information on those who served and were buried in overseas military cemetaries, who have been memorialized on Tablets of the Missing and who have been listed as killed in action. The fourth database is a Registry of Remembrances honoring US Citizens who helped to win the Second World War and this includes the listing of servicemen and women. To be included in this Registry, a family member or friend has to submit the information online to the WWII Registry of Remembrances; no one is automatically included. This is a very public way of saying ‘thank you’ to family members, friends, comrades or anyone else who has inspired someone to submit an enrollment in their honor. I did this for my Dad several years ago and I know how touched he was; as mentioned he was very proud of his service and knowing it won’t be forgotten mattered to him greatly. I hope that if any of you have a family member or friend who has not been included that you will take the time to make it happen. Once included, the database can be accessed both online and at the memorial itself. Here is the listing for my Dad, John (Jack) Gregory Bathe; not just as an example but because I will continue to share this every Memorial Day and Veteran’s Day. We had a difficult relationship for many years but nothing can change how proud I am of his service to our country. I really do believe this would be the perfect potato salad for him. Like many, I grew to love blue cheese as I matured so I remember the ‘ew’ factor I had when he would put some on a salad or over a steak he would grill for himself and my mom (kids got burgers, parents got steak!). The bacon part is easy; he made bacon and eggs for us every Saturday morning that I can remember as a kid; so bacon it is. If you’re not sure about blue cheese; you might try Gorgonzola. I fondly call it ‘blue cheese light’ because while it has a similar flavor, it is not as pungent and strong. I’m hoping to have a small barbecue this holiday; happy to have some grass in my backyard, a few pots with flower and herbs and a grill ready to go. This salad, a great steak and a cocktail is all I need. I’m also wishing you and yours a safe and happy Memorial Day! Combine the bacon fat, vinegar and salt in a small food processor or shaker jar and combine well. Clean (but do not peel) the potatoes and cut into 1" cubes. Immerse in salted water; bring water to a boil and boil for 7-10 minutes, testing potatoes to see if they are done. They should be firm but easily penetrated with a fork. Remove from heat, drain and place back into pot. Add the marinade and stir gently to cover all of the potatoes; refrigerate for at least one-half hour. Make the dressing by combining the blue cheese, sour cream, Greek yogurt and Dijon mustard; mix with a whisk and season with salt and pepper. Add dressing, bacon and green onion to potatoes and mix gently. Taste and adjust seasoning with salt and pepper if necessary. Refrigerate for a minimum of fours hours before serving. Garnish before serving with green onion, crumbled blue cheese and bacon bits. Best if refrigerated overnight if possible. The more time the dressing has to meld flavors with the other ingredients the more subtle and fabulous it is! I made this potato salad yesterday for a gathering of friends, including kids and they all loved it. Great recipe! It was delicious!!! It will become part of our menu for years to come. Thank you for sharing! Thanks for letting me know Marcia; I just love it too! You have been busy while my kids were here. Love this and i bet you already know how much you look like your dad. I never liked blue cheese until the last few years and I am still a “light” person! My mother in law though, would consider herself a heavy person, at least when it comes to blue cheese! We’re both daughters of men who served in WWII. I too, am proud of their servce. I love that this recipe is a nod to things you know your father would have liked…..it’s a lovely gesture. Thank you for a Memorial Day memory. My dad’s gone too but he and his friends all talked about their war years. I tried to be quiet so I could listen. They would love this salad! Have a great long weekend. I was just telling a friend yesterday how different that generation was. They came home, got married and had families and most went on with their lives. No time for psychological problems or drugs to soothe them. My dad was having nightmares in the last couple of years; his only way to sleep was to keep some music on during the night; for some reason that helped. But still; he never burdened anyone else with the horrors of his experience. Maybe he/they should have. I love the way your recipes sound and would love to cook them but i can;t seem to get not the recipes…any hints? I did some updating today and seems it turned off my recipes…cool huh? All fixed now; thanks for letting me know Sarah! What a lovely post! 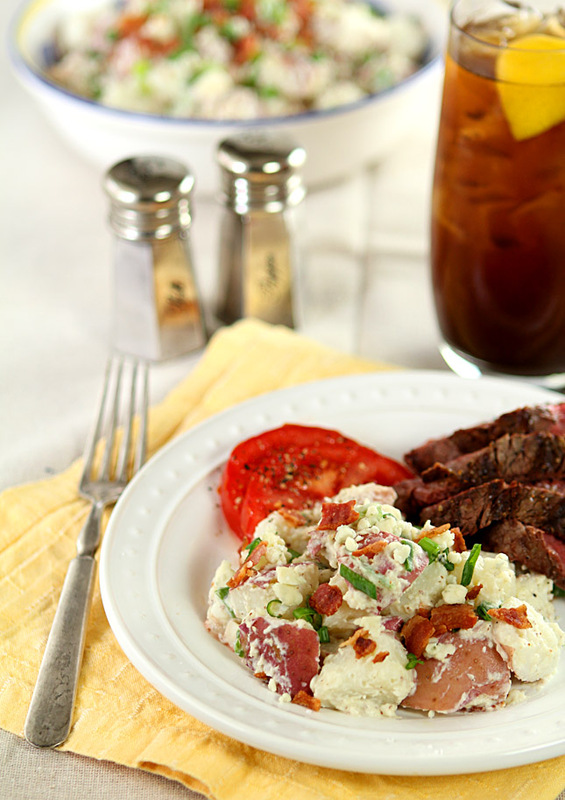 I’m sure fathers everywhere would love this potato salad! What a lovely tribute to your father! My grandfather also served in WWII and now I’ll be looking at the remembrances. Love this potato salad. Blue cheese is something I’ve only come to appreciate as an adult. This salad sounds like the perfect way to enjoy it! Really nice tribute to your dad! I’m lucky that my father is still here at age 93. Had lunch with him today, and he’ll be celebrating Memorial Day with us on Monday. Anyway, l love blue cheese, and it’s wonderful in potato salad. I gotta make this! Thanks. You are lucky John…and so is he to have you! 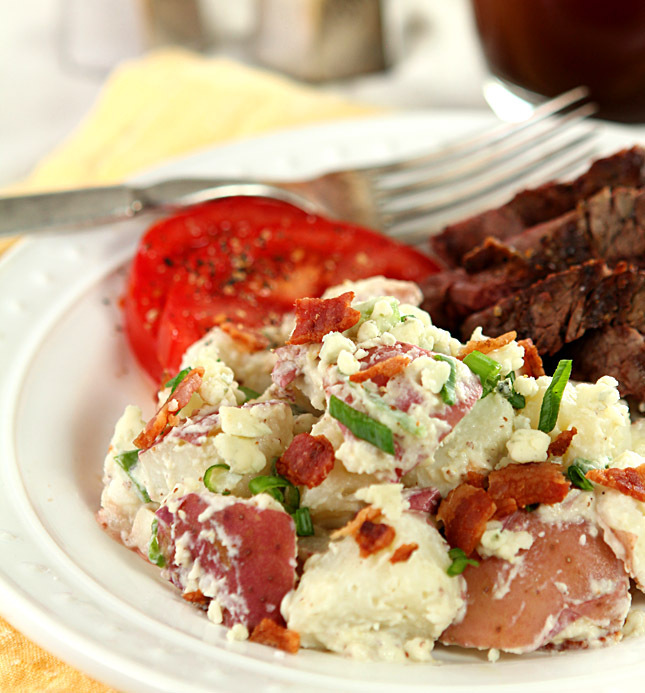 I’ve always loved my main potato salad recipe but this is vying for first place we loved it that much. This is a nice tribute to your dad and the men and women who served and are serving. And this potato salad sounds so good. Blue cheese and bacon with carbs – yes. Thank you Norma and you made me chuckle…yes with carbs! This is a special tribute to your dad, sounds as though he would have enjoyed it. Thanks for bringing attention to the men and women in our military. You are right as they should be in the forefront of our thoughts this Memorial Day weekend. This looks perfect served with those sliced tomatoes and a grilled steak. I think any dad would love to have this any day. I was forced to eat it in his honor too; I can attest to what a terrific meal it was!